In this post, we will explain why this location is popular, how to plan your visit, and some nearby attractions you may want to visit. We will also provide tips on when to go, what to see and do and how to get there. What are the Spanish Steps? Named after the nearby Spanish Embassy, the Spanish Steps have been in Rome since 1723. They connect the Piazza di Spagna at the bottom with Piazza Trinita dei Monti at the top. Located on the eastern side of the old city center, there are a lot of interesting places to see in the area. There are a total of 138 steps to climb, but if you aren’t sure whether or not you can make it, consider taking the lift which is right next to the metro station. The Spanish Steps are typically used as a meeting place where people will relax and take a break. Visitors will find several shops at the base and usually a few artists at the top providing portraits for tourists. For more information about what you can find nearby, check our nearby attractions section. The Spanish Steps are a popular meeting place and they can get pretty busy every now and then. As a matter of fact, several walking tours begin or end at this location. This section will focus on details such as the best times to visit, how to get there, and what you may see while you’re in the area. The first thing to note about this attraction is that you can visit pretty much any time of the day. These stairs are accessible from morning till night, so you won’t necessarily have to worry about hours in the same way you would with other historic sites in Rome. That being said, there are times when crowds begin to dissipate or have yet to form and it is much easier to climb the Spanish Steps. According to some visitors, the best time to visit is in the morning before tourists flock to the area. If you want to make your trip during this time, consider heading out between 7 am – 9 am for the most privacy. Alternatively, you can also make an attempt to catch the lunchtime lull. Between 12 pm – 2 pm tourists and locals alike tend to head into nearby restaurants and cafes to get a bite to eat. According to some sources, the Spanish Steps are often much less crowded during these times. Finally, the last recommendation from past visitors is to come when the sun sets, between 6 pm – 8 pm. According to some reviews, this is the point at which many tourists are either planning a night out on the town or heading back to the hotels. For specific information on when the sun will set, click here. There are several evening walks of Rome’s city centre that start from the Spanish Steps. You can expect even larger crowds than usual during the spring. 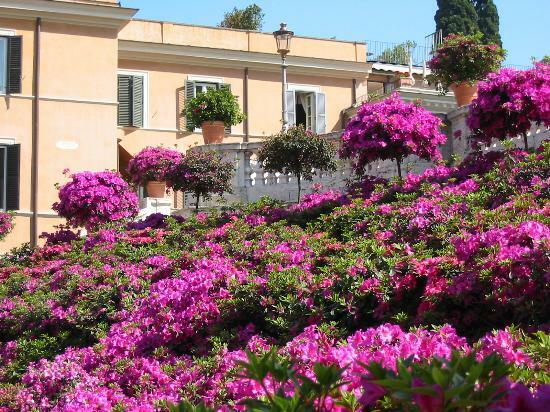 This is the time of year when the Spanish Steps are adorned with thousands of azaleas, giving the historic site a beautiful splash of color. Click here for more details and additional ideas for things to do in this city during the spring. The Spanish Steps are located in Rome’s centre just south of the Villa Borghese, the city’s massive park. Regardless of how you choose to get here, we recommend using this Google Maps link for directions to the Spanish Steps. The Spanish Steps are easily accessible from pretty much anywhere in the city center. Most visitors will probably be able to walk here quite easily. In addition to a nearby bus stop, you will also find the Spagna metro stop right next to this location. Both the public buses and the metro trains stop at the top of the steps in front of Trinità dei Monti. For more information about these options, make sure to read our post on using the Rome metro system. Alternatively, there are also nearby stops from hop-on-hop-off bus tours which will take you very close to this landmark. If you’re already planning on using one of these services, you won’t have to worry about buying metro tickets. For more details on this option, read our post about Rome bus tours. If you’re planning to visit the Spanish Steps, there are a few tips that you may want to keep in mind. Even if 138 steps seems a bit daunting, it shouldn’t be too difficult to climb to the top of this popular site. There are several levels which will allow you to take a break while climbing and enjoy the view. It’s also perfectly fine to stop and rest on the steps themselves, as locals will often do this while hanging out with friends and family. Several popular walking tours in Rome start or end at the Spanish Steps. If you’re interested in learning more about the historic sites nearby, consider taking one of the many tours detailed on our Rome City Center post. Although you can expect much higher prices than usual, there are a lot of shops in the area with a variety of different goods. Even if you don’t feel like spending any money, there’s definitely room for some window shopping in the area. Although the Spanish Steps often draw pretty large crowds all by themselves, a lot of people visit this location because it is so close to several other historic sites. Here are a few attractions you may want to visit while in the area. This popular tourist destination is only a 10-minute walk away from the Spanish Steps. Many bus tours stop nearby, and most travelers won’t have much trouble walking to and from both locations. Fontana di Trevi is the largest Baroque fountain in all of Rome. The structure was designed by Italian architect Nicola Salvi in 1730 and completed by Pietro Bracci in 1762. Read our full post. At the foot of this landmark, you will find the Keats – Shelley Memorial House. This is a museum dedicated to famous authors John Keats and P.B. Shelley who actually walked on the nearby Spanish Steps. This plaza is also located at the foot of the steps, and it is a popular meeting place for people who plan on climbing up to the next plaza. Visitors who want to get a picture of the Spanish Steps from below should consider taking their photo here. There is also a fountain at the center of this plaza which we will discuss in further detail below. Located just a few blocks from the Spanish Steps, Villa di Medici is one of the most historic sites in all of Rome. In addition to wonderful gardens and an extensive library, this academy also hosts special exhibitions throughout the year. Guided tours are available at least a few times per day from Tuesday – Sunday in French, Italian and English. Although it’s a bit further away, this gallery is one of the more popular destinations in Rome. If you feel like walking, you should expect a 25-30 minute trip from the Spanish Steps to the Borghese Gallery. Discount passes such as the Roma Pass include admission to this museum in addition to a hop-on, hop-off bus tour. If you plan on using a tour bus to reach the Spanish Steps, this could be a good way to save money. This is perhaps the biggest and most impressive fountain in the area. Located right in the middle of Piazza di Spagna, the Fontana della Barcaccia was constructed in the 17th century by famous Baroque designer Pietro Bernini. This structure is designed to look like a half sunken ship with water overflowing on the sides into a basin. Travelers will likely spot this interesting structure just south of the Piazza di Spagna. The top of this column is adorned with a bronze statue of the Virgin Mary stomping on a serpent. Surrounding the column are statues of Moses, Isaiah, Ezekiel and King David. During the Feast of the Immaculate Conception on December 8th, pontiffs will come and place bouquets of flowers at the base of this column. You’ll find this plaza at the top of the steps, right in front of the Trinità dei Monti church. This plaza includes an obelisk known as Obelisco Sallustiano which should be fully visible from the bottom. Visitors may want to consider taking a break to enjoy the view from above. Alternatively, you’ll also find the metro stops nearby. This is one of thirteen ancient obelisks located in Rome. Each one was crafted by ancient Romans and based on the design of ancient Egyptian obelisks. Erected in 1789, this structure was named after a garden known as Horti Sallustiani. Located just one block north of the Obelisco Sallustiano, this small fountain should make for an interesting visit. The Fontana del Bottino was made from an ancient sarcophagus and it includes one central figure with two additional figures on either end. A total of three jets of water pour from the sarcophagus to a small pool of water below. Roughly one block north of the Fontana del Bottino, this fountain is yet another great place to visit while you’re in the area. Named after the nearby church, this fountain is found at the entrance of Villa Medici. The structure is unique for its cup shape and the cannonball which adorns the center of the fountain. If you’re up for the trek, you might want to consider heading to the Vatican after your trip to the Spanish Steps. Admission to the Vatican Museums and the Sistine Chapel is included with more than one Roman tourist pass. These attraction bundles usually include a hop-on-hop-off bus tour as well, making it even easier to get here. For more information about this historic site, read our post about the Vatican Museums.